While brooding in his study over how to be a more effective crime fighter, Bruce Wayne saw a bat come through his window (in the earliest Detective Comics portrayal simply flying in an open window, in Post-Crisis continuity such as Batman: Year One, dramatically crashing through the glass) and perch on the bust of his father. Realizing that "criminals are a superstitious, cowardly lot," Bruce adopts the persona of a bat in order to conceal his identity and strike fear into his adversaries. Subsequent origin tales have had Bruce terrified by bats as a child, and observing a bat costume worn by his father at a costume ball, but the primary impetus of his decision to adopt the bat persona has always been the incident of the bat coming in the window of his study. It is as a result of this incident that the batsuit was developed. As Bruce's career as Batman continued, he evolved and updated the suit to keep ahead of technology in the streets of Gotham, using the resources of Wayne Enterprises to do so. Eventually the suit itself became a kind of totem and symbol for himself and others, an example of the realm of darkness defending the realm of light. 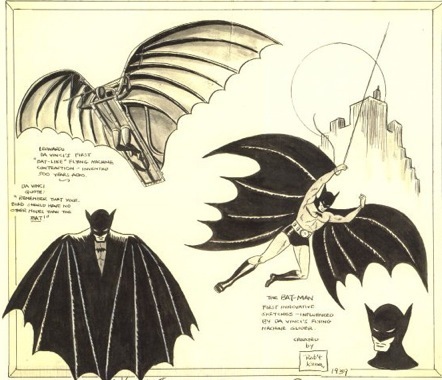 Designed by Bob Kane in 1939, the original rendition of the suit was little more than gray tights covered with black trunks, short gloves, boots and a scalloped cloak that was affixed to the arms. Batman wore a bulletproof vest underneath the suit. 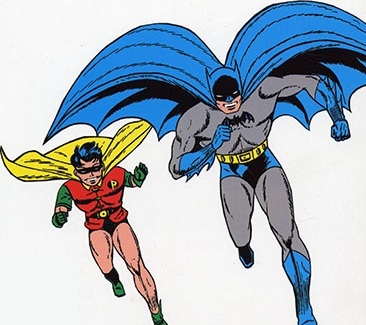 Batman's cape, cowl, gloves, briefs, and boots are usually either of two colors: Black (Usually with blue highlights) or blue entirely. The blue highlights on the black are there in order to show detail and give the illusion of three-dimensionality. Over time, the initial blue highlight spread out over the previously black cape and cowl to become the dominant color. Thus artists' renditions depict the costume as black and gray or blue and gray. Other elements, such as the utility belt and the length of the cowl's ears, have been changed by various artistic teams.